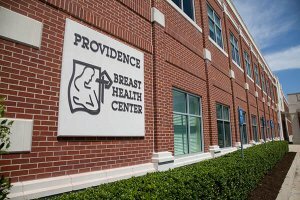 The Ascension Providence Breast Health Center, located off campus at the corner of Fish Pond and Cobbs Drive, features advanced digital technology in a spa-like atmosphere that was designed just for women. The Breast Center exemplifies the Ascension Providence commitment to compassion and excellence. We’ve put the best professionals and state-of-the-art screening and diagnostic equipment in a suite that features comfort, privacy, and compassionate care. In short, we’ve done the impossible: we’ve made getting mammograms a pleasant experience, because nothing should keep women from this very important health screening. The Ascension Providence Breast Health Center offers 3D mammograms. Also known as digital breast tomosynthesis, 3D mammograms represent the latest tool in the fight against breast cancer. By taking a series of images and viewing them as individual thin layers instead of looking at all your breast tissue at once, your doctor can see your mammogram results more clearly. This revolutionary new screening and diagnostic process is designed to improve early breast cancer detection. The American College of Radiology encourages all women age 40 and older to have an annual mammogram. Early detection is vitally important for effective cancer treatment.Call today to for an appointment at 254-235-3535 or schedule one online. It’s quick and easy, and it could save your life. Find an available time to schedule your next mammography.